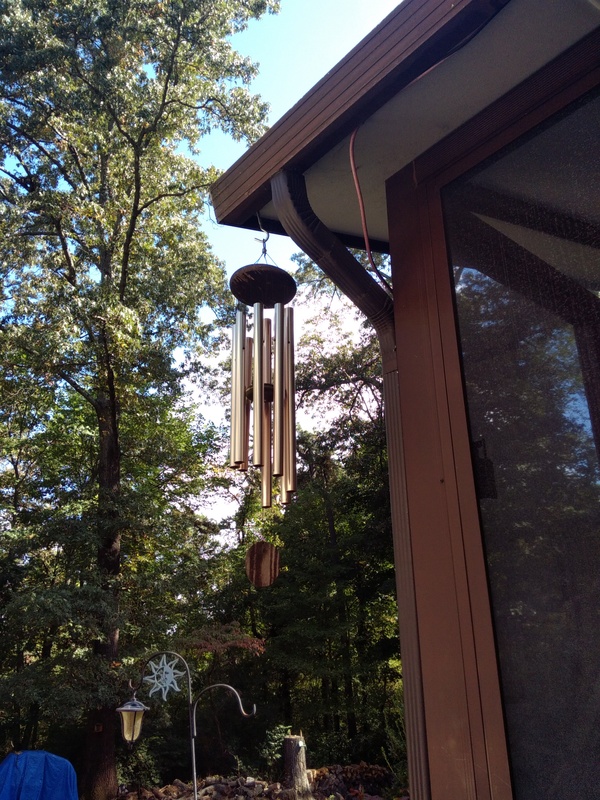 WIND CHIMES – SOUND OR SILENCE? 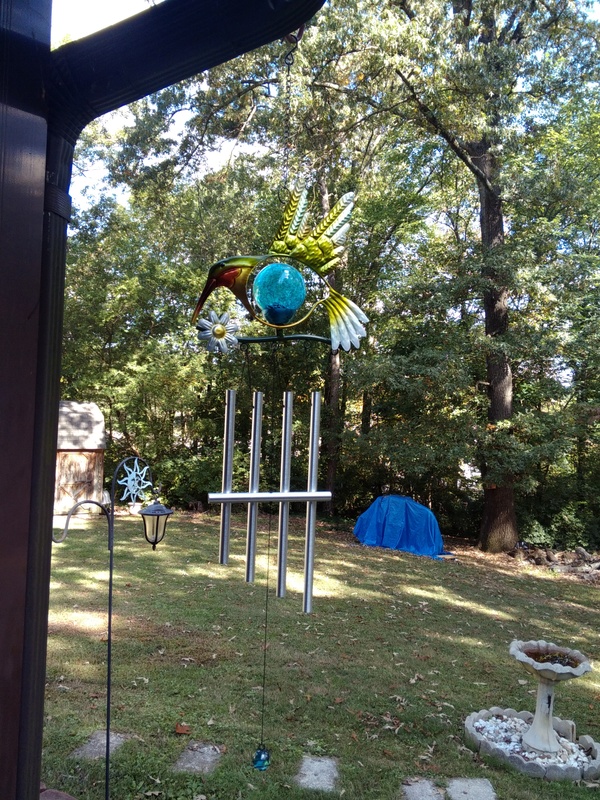 Wind chimes — I love them. I enjoy hearing them when the wind ripples through their parts and the chimes make melody along with the leaves and birds, all of nature combining to glorify God through their music. But, not all the wind chimes are like the two above which are placed outside near the porch windows. 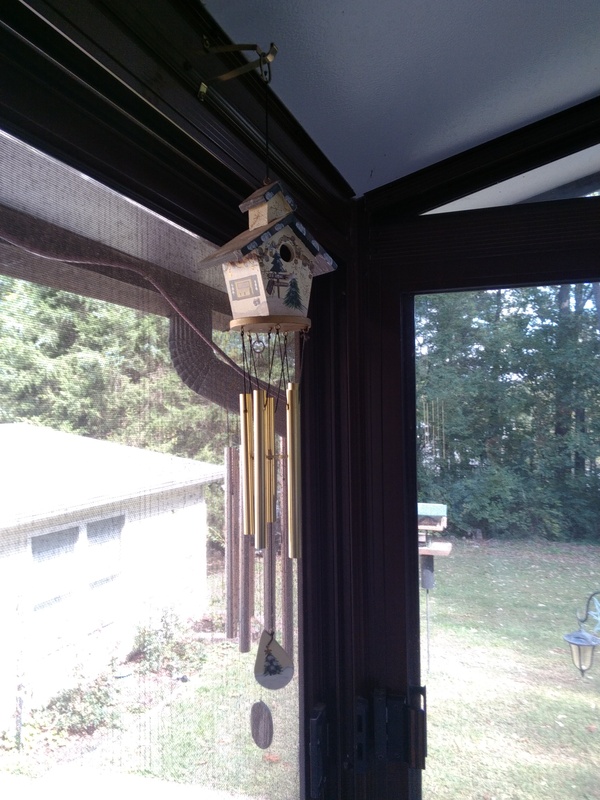 Certain wind chimes have been placed on hooks inside the porch. We did have them outside for a time and their sound was just not … musical, shall we say. The primary problem, though, is that they were not able to withstand the rigors of the breeze. Seems rather weird that a wind chime could not hold it together in the wind, but that is the situation with those that are, now, inside. 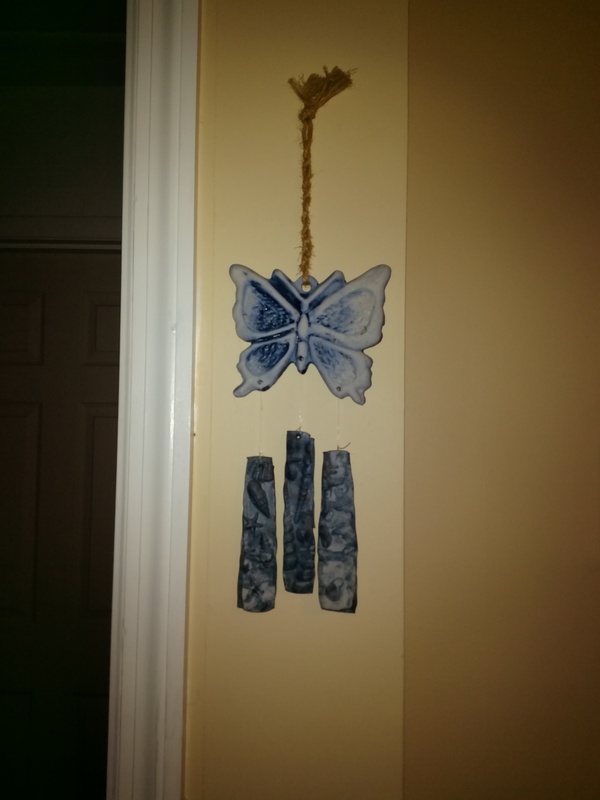 Then there is the pottery wind chime from Hawaii that we had outside and it performed beautifully until one of the pieces broke after hitting the side of the house. It is now in wind chime retirement, hanging on the wall inside the house. 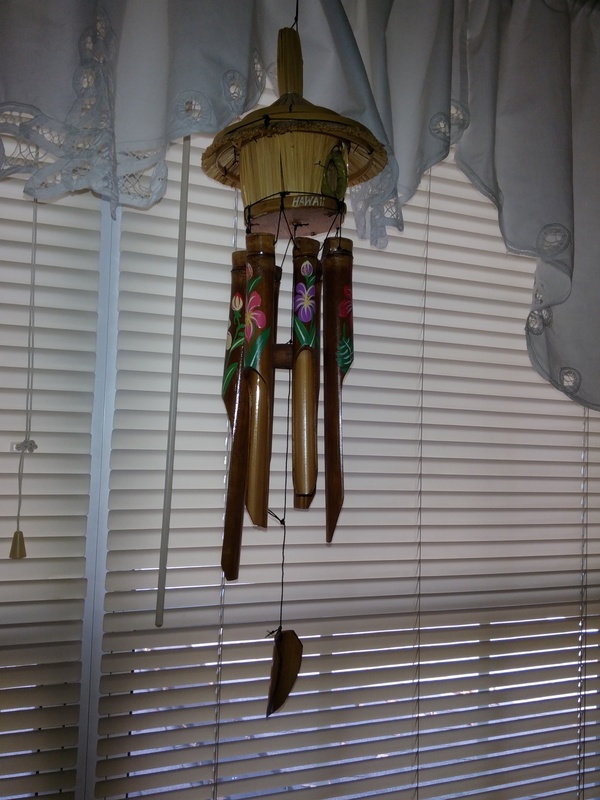 A bamboo straw wind chime was a souvenir from an adventure in Jamaica. The bamboo chimes have all the right pieces, but they just don’t make music – they rather thud! 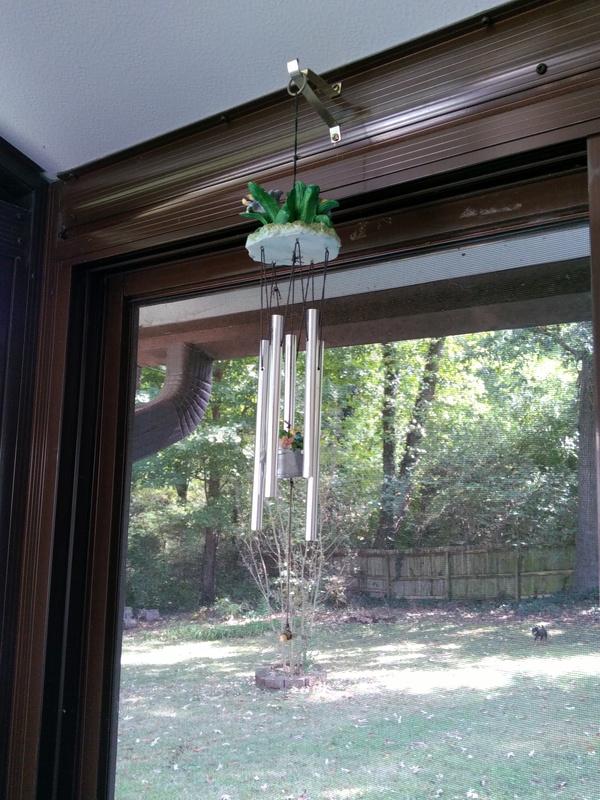 A wind chime without the chime. Just window dressing! 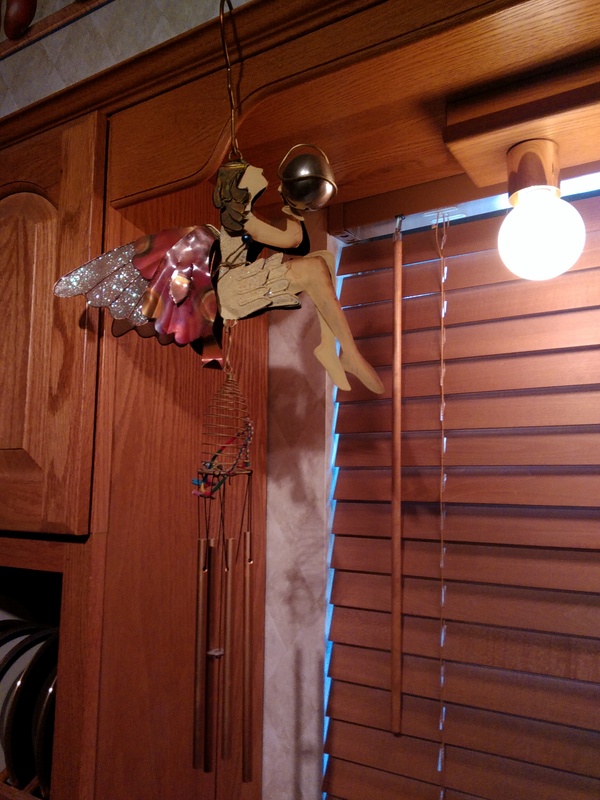 Some wind chimes have extra features, like balls that sparkle and, this one in the kitchen, even has a spring holding the chimes up. Touch it and the whole thing bounces up and down with the chimes giving off a rather tinkling sound. But I wouldn’t want to put it in the wind – the spring would have the chimes all twisted up in no time! 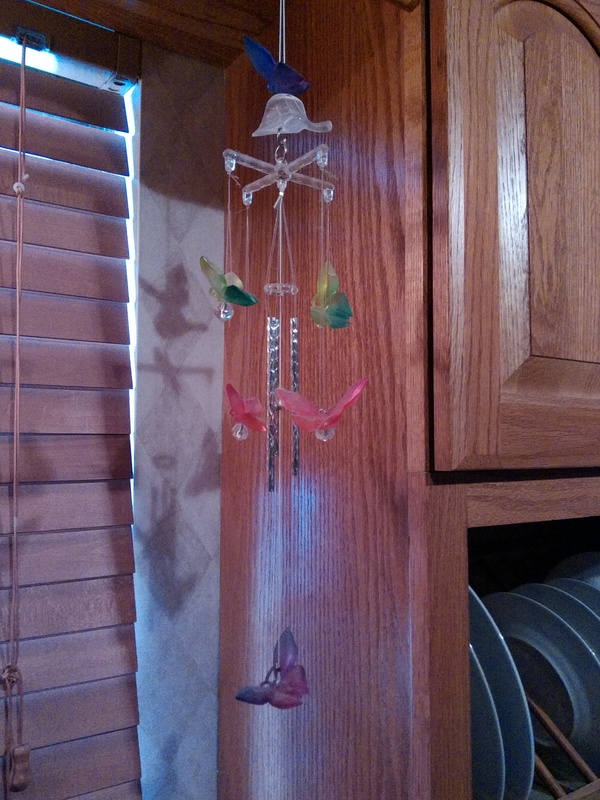 Some wind chimes, like this glass blown chime, are just too fragile to hang out in the wind. It makes pretty music when the lower bob is touched, but it is simply not strong enough to endure the wind that would hit it outside. So it views life through the kitchen window. Those chimes that are outside in the wind are doing what they were intended to do – make beautiful melody when touched by God through the breezes that He provides. Those that are inside the house, for whatever reason, are still wind chimes, but they are not doing what they were intended to do. They are pretty, they are providing ambiance, they are souvenir reminders of the trips that we have taken, but they are not fulfilling the purpose intended for them as wind chimes. In Matthew 5:15-16, Jesus used a lamp as an illustration of something that can fulfill its purpose when being used properly. Of course, putting the light under a basket so that its light, although available, was not able to do its job is foolishness. But Jesus then continues to say that the disciple of Christ should “let your light shine before others.” Why? For the purpose that others would see the works of the disciple and then give glory to God. In other words, if you do not keep Jesus’ words, you are showing by your very actions that you do not love Him. It matters not that you say you love Him. The proof is in the pudding – do your actions show that you are keeping His commands? So the next question is “What has Jesus commanded His disciples to do?” That answer is found clearly in the Gospels. Consider the Gospel of John where Jesus tells us what He wants … actually, He says it three times! Jesus knew that we would need power to do this, so in Acts 1:8 we read Jesus’ instructions to the disciples after his resurrection and just before He ascended into heaven. Thus, we have the commandments, instructions, power and protection, all provided by our Loving Lord. Are we wind chime Christians whose grace-filled life makes everything around us more beautiful? Are we behaving as Christians by loving each other as Christ loved us? Are we loving those outside the Christian family so that they see Christ in us? Are we strong enough to love people even when it is hard and windy? Are we loving people even when they hurt us? Are we wind chime Christians who are fulfilling the purpose God has for us? Are we wind chime Christians who are too fragile in our faith to speak to others or to love those who are unlike ourselves? Are we wind chime Christians who cannot withstand the torrents of difficulties attendant with Christian witness outside the confines of the church? Are we wind chime Christians who have opted to stay inside the church, never getting out into the world so that we are not exposed to anything difficult or challenging? Are we wind chime Christians who are so busy trying to look like Christians that we don’t have the time or inclination to follow Jesus’ command to love others? Father, may I be a wind chime that sounds your love and mercy to others around me. Forgive me when I have been content to sit on the sidelines of life and have refused to let my witness chime out for you. Holy Spirit, embolden me so that I can do the work that you have arranged for me to accomplish and may my witness be love-filled even during those times when the winds of anger or contempt buffet the way. May I reflect Jesus in all that I do, to your honor and glory. < JAN AND JILL AND THE FUTURE! I found an article entitled “Are wind chimes evil” written by Helene Vece and published August 19, 2014. She said that as long ago at 3,000 B.C., wind chimes were believed to ward off evil spirits. In China, they were hung outside the temples to ward off evil spirits and to entice the good spirits to come in. Then the tide turned and they were used to identify places where evil practices could be found. Ironically, at the same time they were thought to be evil, they were frequently used in religious services. In today’s culture, the evil past of wind chime history is ignored and their use is considered soothing to the soul. Hope this answers your question. My question is why do some people say having wind chimes is evil? I’ve always been confused by this. I am so glad you enjoyed the Wind Chime article. Blessings to you today.